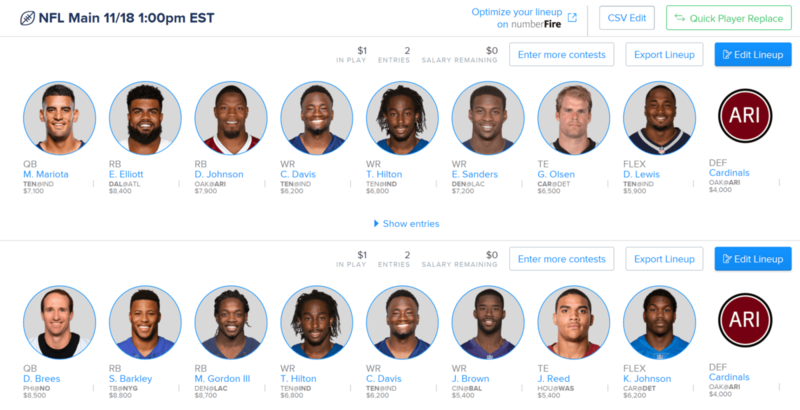 We were 4 for 5 in cash lineups last week, and we’re back for more cash in Week 11! As usual, before we get to winning you bragging rights (and DFS cash), remember, the point of this article is not just to give you one or two lineups for each site, it’s to give you examples of one or two POSSIBLE lineups. Getting exposure to a few different lineups is always a good idea, so don’t forget to mix and match additional lineups from my suggestions below. 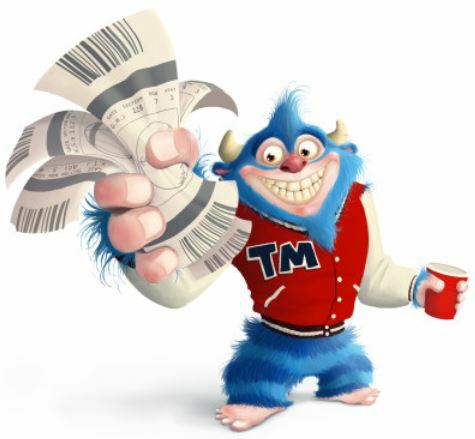 Trust me, it’s a lot more fun that way AND you’ll improve your chances of cashing! Let’s get to winning you some CASH in Week 11 of the 2018 NFL season! So, without further to do, here are my suggestions for the Best Daily Fantasy Football Plays for Cash Games for Week 11 contests, along with they’re prices on Fan Duel (“FD”), Draft Kings (“DK”) and Yahoo! Daily Fantasy (“Y!”). The Philadelphia Eagles and the New Orleans Saints have the highest over/under of the week (56). The Eagles are 14th against the pass and just 24th against the run, while the Saints are 3rd against the run but just 28th against the pass. The Eagles backfield is massive committee right now, and against a solid run defense, I’m off all of them. But I expect a negative game script for the Eagles as they’ll likely have to play catchup, so I do like the Eagles pass offense against a weak Saints secondary. That means I really like Carson Wentz, Zach Ertz, Alshon Jeffery and Nelson Agholor, in that order. And I love every skill player on the Saints side, preferably Drew Brees, Michael Thomas and Alvin Kamara. Because of the lack of recent production, I’m not as big on Mark Ingram, Benjamin Watson and Tre’Quan Smith, but feel free to punt if you need the cap space. The Tampa Bay Buccaneers and the New York Giants have the second highest over/under this week (52.5), and sets up to be potential shoot out based on both subpar defenses, with the Giants being 28th and the Bucs being 31st. You know I don’t trust Eli, but Odell Beckham Jr. looks to be back and is clearly getting the majority of the targets, and Saquon Barkley is guaranteed to get at least 100 scrimmage yards every week, so I like both of them this week. And on the Bucs side, I don’t have tons of confidence in Ryan Fitzpatrick after a let down in Week 10, but I do like Mike Evans and O.J. Howard. The Tennessee Titans and the Indianapolis Colts have the third highest over/under this week (50.5). I know you’re starting to see a pattern here, but these high over/unders just happen to coincide with solid matchups this week. Tennessee’s defense isn’t terrible, but they’re just 18th against the pass, and they’re 25th against WR1s. You probably know where I’m going with this, and you’d be right, as I like T.Y. Hilton‘s outlook this week, and don’t mind also using Andrew Luck. Indy’s defense isn’t much better, being 27th against the pass, 29th against WR1s, and 28th against RB receptions. So Marcus Mariota, Corey Davis and Dion Lewis all look to benefit. The Atlanta Falcons have the worst defense in the NFL, so I’m a fan of the Cowboy’s top ground and pass options, Ezekiel Elliott and Amari Cooper. I’m not totally sold on Dak Prescott yet, so I’ll probably give him a pass. Denver is 4th against the pass, but only 18th against the run. Melvin Gordon, who has the 4th most points per game (8) of all RBs in the NFL, totaling 11 TDs, is in a nice spot to take advantage. Feel free to lock him in. Oakland’s defense is a complete dumpster fire, and they rank 29th against RB receptions. David Johnson is in a nice spot to do some damage this week, and is available at a nice discount. Defenses are priced rather erratically amongst the DFS sites this week, so I just go for the best value at each site. That turns out being the Arizona Cardinals defense against the aforementioned dumpster fire in Oakland on FanDuel, the Houston Texans defense against the underwhelming Redskins on Draft Kings and the Baltimore Ravens defense against an AJ Green-less Bengals on Yahoo DFS. 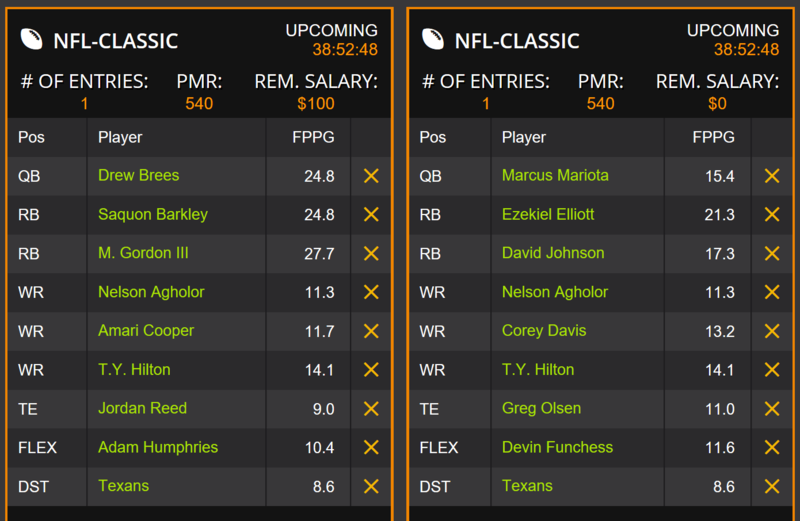 Good luck everyone, and I hope you all win DFS Cash in Week 11!